Shilpa Raj is an author who has made her debut with the memoir The Elephant Chaser's Daughter. The author has been in different parts of the country as well abroad delivering talks on her book. The Elephant Chaser's Daughter has certainly put Shilpa in a different league of the contemporary authors. Here is a conversation with her. Our team has posed different questions to Shilpa about her writings and also her debut book. You will certainly like the conversation below. Question: Shilpa, finally, it can be said that your literary work has reached a large readership as you would have liked. How do you feel now? And how do you see it for the future of your writing? Shilpa Raj: I’m very humbled by the wide acceptance and support that my book has received since its release both in India and abroad. I never thought the general public would give it such a kind reception. I feel more encouraged than ever to continue writing on topics of public importance and personal interest. Question: The Elephant Chaser’s Daughter has become almost a synonym for honest writing and an inspiring story. You have been going around the country and abroad for promoting the book. Generally, what are the frequently asked questions? Shilpa Raj: People everywhere are curious about the motives behind my writing this book. Many want to know more about my family and how my relationship with them has evolved over the years. Some ask about my future goals on the professional and public level and how I plan to give back to society. Many want to know my thoughts on Shanti Bhavan’s decision to admit only one child per family to the school. Others are more understanding of that decision and are interested in knowing how I plan to stay connected to the school and support its work. Question: Does it ever occur to you that things could have been a little different than what has been happening with the book? Do you think it could be better or is this the way you wanted it to be? Shilpa Raj: I am happy with the way my life and the book have turned out and I am open to all the personal and professional changes that this journey will take. Question: How would you define your journey from the beginning to where you are now? You may be humble and not accept this statement, but you have become an inspiration to many people out there who have read your book. Do you feel it’s your responsibility to carry it further forward and live up the expectations that others might have? Shilpa Raj: At times I myself find it hard to believe the stage where I am now. I have a Master’s degree in psychological counselling and published a book -- both these give me satisfaction and joy. But I find it overwhelming when others call me an inspiration. I have learnt to accept it humbly and value it, though it puts a lot of pressure on me to live up to everyone’s hopes and expectations of me. On the positive side, I feel accountable to my readers and supporters for the decisions I make and the way I choose to live my life. As an author, I feel the responsibility to serve as a voice for those who go unheard. This is a duty I respect, and never want to fail in it. This motivates me to continue to do well in life and not slacken down or take things for granted. Question: Tell us about your early writings, Shilpa. Because the book that you have written very rarely lets the readers feel that it’s just a writing of a newcomer! You seem a matured writer! Shilpa Raj: I still remember my English teacher discovering my ability to write well when I was in the fourth grade. She and others along the years continued to encourage me to explore my voice through my writings. In high school, I ran the school newsletter and was a voracious reader. I wanted to be a journalist someday and ran the newsletter with much passion. I always kept a journal and this served as a steady writing exercise. During days when I was down, writing about it helped me express myself and cope with my struggles. Question: What is the further that you are planning with your writing endeavours? Are there already some new ideas already on the table or are you still searching for a theme? Shilpa Raj: I’m very enthusiastic about pursuing writing and publishing many more books. I have several ideas for my second book. I want to write on non-fictional subjects mostly and maybe try my hand on fictional topics as well. Since I plan to build a strong career for myself as a mental health professional, I know I’ll be writing a lot in this field and on my experiences. Question: And just aside the book, Shilpa, what do you think we can do to bridge the gaps – poverty and social discrimination -- that have been prevailing for so long in our society? How can we improve things? Shilpa Raj: The gap between the rich and the poor can be bridged by offering and availing equal opportunities for a quality education. Education is the key. Children from poor homes begin at a disadvantage in many ways, and this is further exacerbated when the system does not allow them the chance to study in good schools that their peers from rich homes do. This disadvantage is translated into the workplace and the cycle of imbalance in opportunities continues. 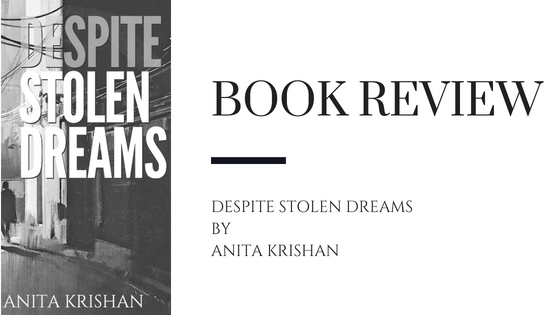 Anita Krishan's latest novel, Despite Stolen Dreams, was published last year and since the publication, the novel has been very popular among the critical readers and the readers who want to read novels with a resolve rather than fiction with mere entertainment. I have finished this novel last week and today I find myself very much in a mood to let the readers know what do I feel about this fiction book. So, let's get into the book review mood directly. Without taking so much of your time, I will tell you the good, the better and the best in the novel. Good afternoon, readers! We are here, rather soon, once again with a new author we are featuring on our website. 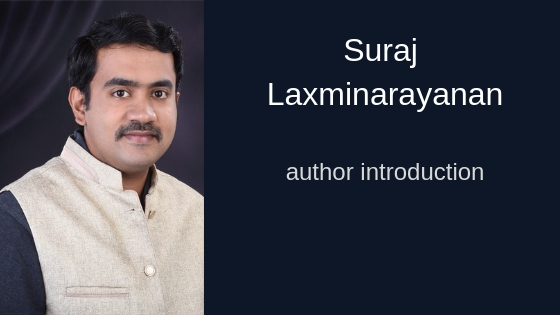 It's the time to get introduced to Suraj Laxminarayanan - the author who has made his debut with a crime fiction of volume, Elephants in the Room. The novel is set to launch in September 2018. However, before you read the author, you must know about him as well. So, let's discuss the debutant novelist in detail. 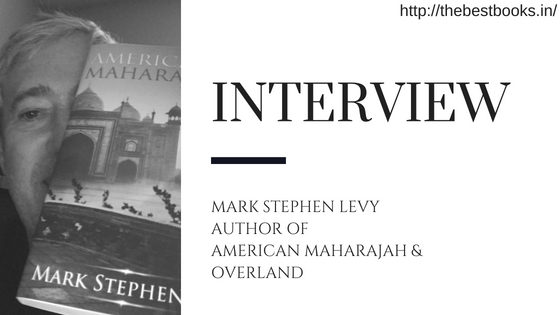 Dear Readers, we present an interview with the American author Mark Stephen Levy who has recently published his second novel, set in India, American Maharajah. His novel has been liked and appreciated by the Indian readers for its connection to the Indian subconscious. In one of this Author Interviews, Mark talks about his book, his writing and also his future plans. TBB Q1: Let’s start with congratulations for your quality fiction, Mark! It was really a good experience reading your book and as many readers have pointed out, it was indeed mature and wholesome. When you look back, what do you think of American Maharajah now? Mark Stephen Levy: Thank you for the congos! I really like this story and not because I wrote it. It’s the kind of story, if I ever picked up a book to read, this would be the one. I think it is a timeless story, and if it isn’t widely discovered now, it will be going forward, at some point.